I’m a year-round statement earring wearer, but can we all agree that there’s something especially fun about accessorizing during the summer? 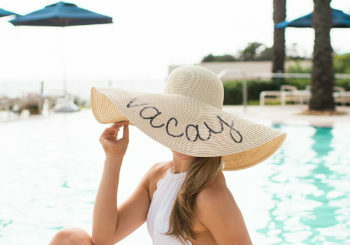 From summer vacations to happy hours outdoors to wedding festivities and so much more, there are endless opportunities for stand-out silhouettes and lots of color! 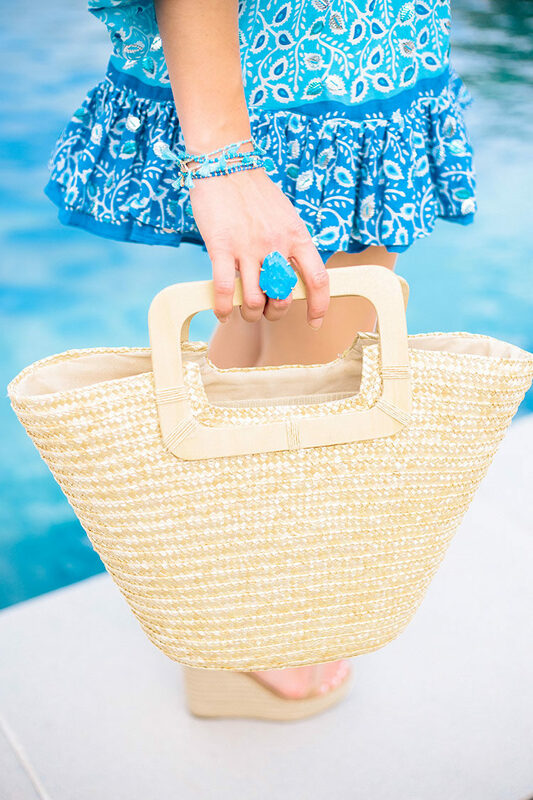 In my opinion, no one does summer accessorizing than Kendra Scott, a brand I’ve loved and worn since college. 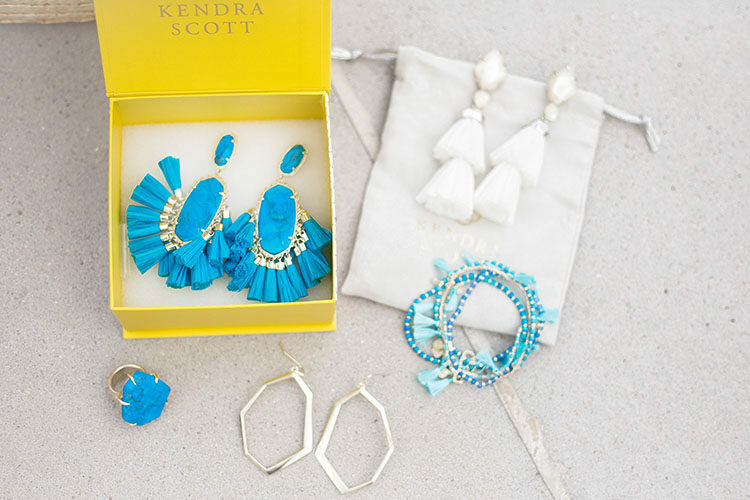 It’s no secret that I love bringing bold pops of color into my ensembles, and Kendra Scott makes that oh-so-easy! 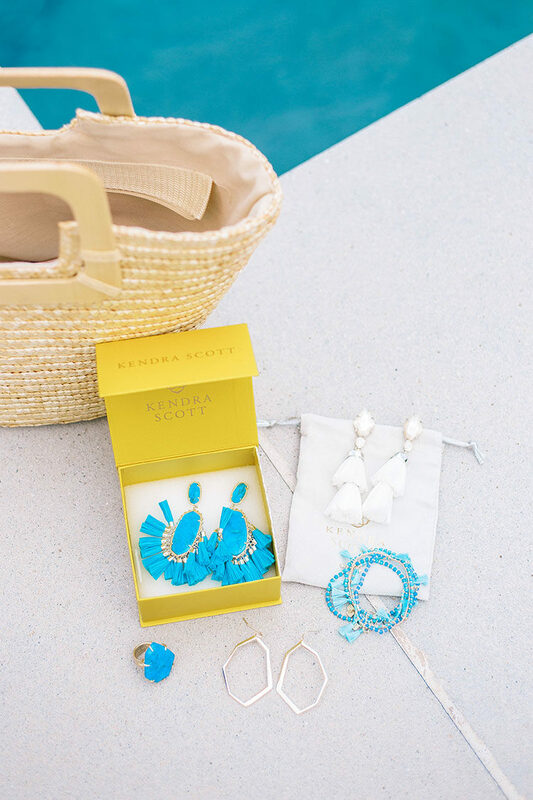 Last month I shared my five favorite pieces from the Kendra Scott, and I’m thrilled to do the same today with the summer collection! Y’all, take it from me… you’re going to love it. 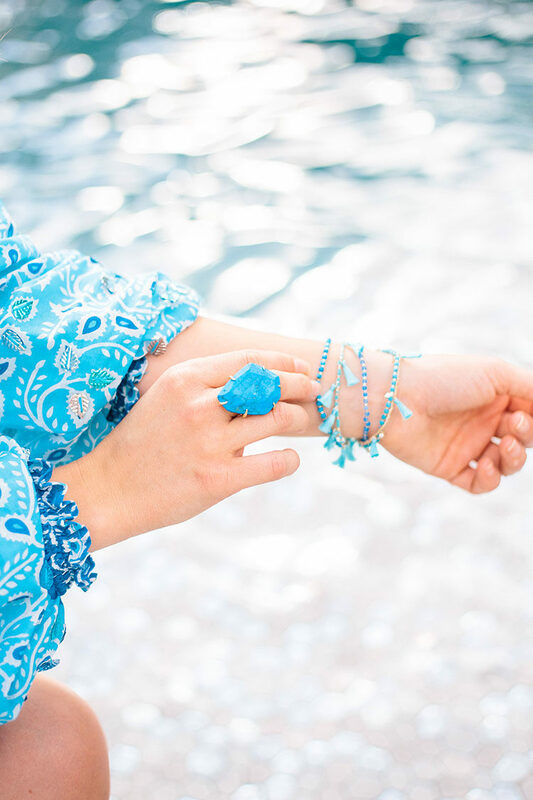 If you’ve followed along for a while, you know that my favorite shade to accessorize with is turquoise. Maybe it’s the Texas girl in me, but there’s no combination I love more than a lovely outfit accented with blue! 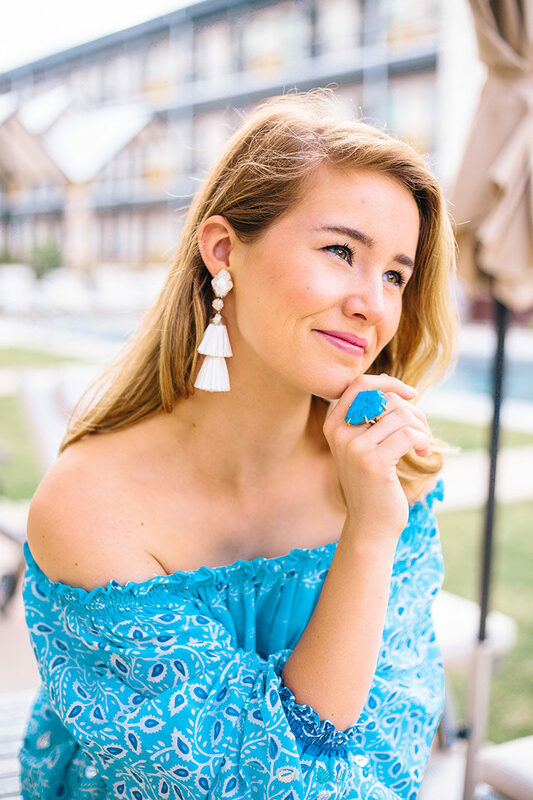 That’s why I couldn’t stop myself from saying “yes!” to the Cristina Statement Earrings in Aqua Howlite. 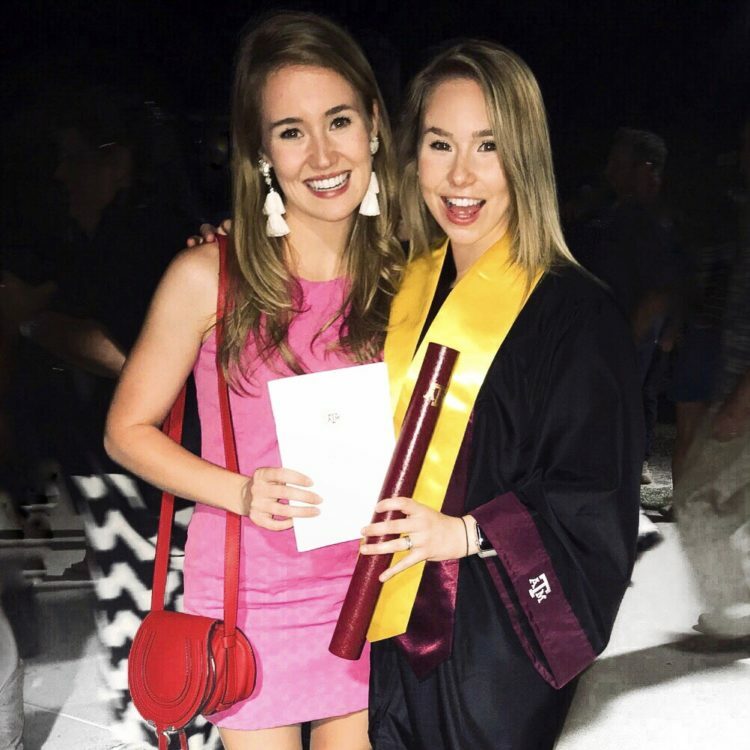 I love how the Kendra Scott team took the classic Danielle (my go-to in college, as seen at the bottom of this post) shape and added to it with tons of gorgeous tassels! It’s the perfect earring for any sort of fiesta. I loved this shade of blue so much that I decided it was a must-have in the Megan Cocktail Ring and Julie Gold Stretch Bracelets as well. We can’t let the ears have all the fun… these two pieces bring color to an entire look! 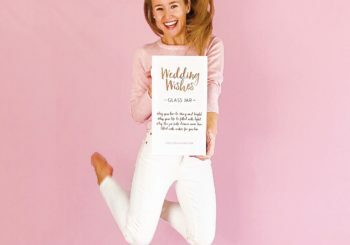 And if you’re looking for something a bit more neutral without sacrificing on the wow-factor, you’re going to love the Denise Statement Earrings and a modern take on the classic hoop, the Lindsey Drop Earrings. 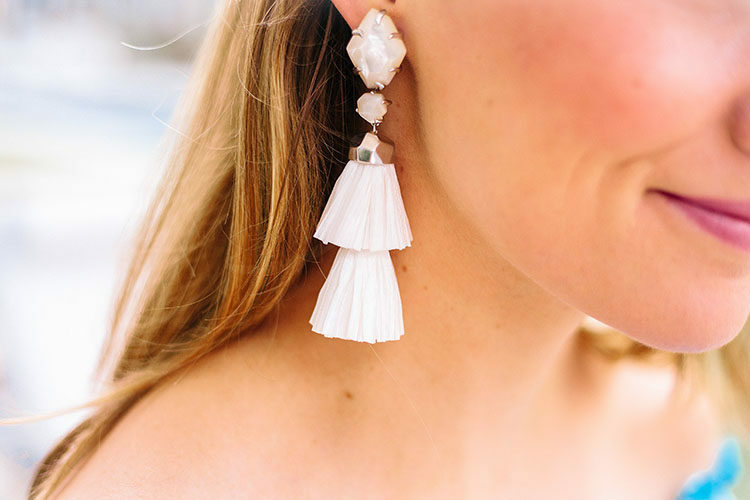 Fun fact about the Denise Statement Earrings… the tassels are removable! That means you can wear all three, remove one tassel for a mid-length look or simply wear one tassel for a smaller statement! I love that this one earring gives you three different, equally-fun looks. You’ll find me wearing the Denise with two tassels at my sister’s graduation below! If you’re subscribed to my email newsletter “Happy Mail,” you heard that I’m leaving for Italy (!!!) this Wednesday! You can bet I’m bringing these beauties along. Thank you, Kendra Scott, for sponsoring this post. I love the new Kendra Scott pieces! It’s so cool that the tassels are removable on the Denise ones! Have the best time in Italy! I absolutely love the bracelet set, gorgeous color and super fun! Love these perfect gems! The blue is so gorgeous!! UM! These are my favorite photos of you ever! Seriously, I think you are meant to wear blue, everyday all day, it is YOUR color! My friend Kelly introduced met to Karen Scott and I adore all her jewelry. As a girl who cannot wear cheap/fake jewelry, I am always looking for a well made statement earring! LOVE all the turquoise!!! That ring is pulling on my heartstrings! what beautiful photos! you look absolutely stunning!